Our rigid heddle loom can easily be used by itself or in conjunction with a backstrap or larger inkle loom. Just the thing for the historical re-creator, Civil War, Renaissance Faire, SCA, great for making belts, straps, and trim. Easy enough for children, but makes a professional looking belt. Great little loom for demonstration weavers, you will also find this a handy little tool for sampling color and textures. Weave up to 25 threads wide, at less than 5 inches wide it is small and compact making it easily transportable. This loom made of 1/8" Birch plywood, hardwoods subject to availability price will vary. 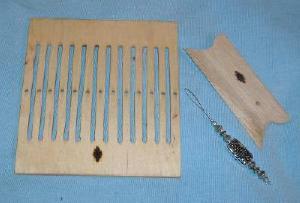 The Belt or Strap Loom comes with basic instructions, a shuttle and threader. Threaders come in an assortment of styles and colors. Thank you for your interest in our products. If you choose to buy more than one item at a time, please send us your list of items and we will send you an invoice. Thank you for your patience.